Web Company India is very strict in search engine optimization. We believe that no web project is complete without doing the the search optimization. And that is why we employ experienced SEO professionals for optimizing the website we created. Through the Optimization tactics we implement, your website will be placed highly ranked in all the major search engines like Google, Yahoo, MSN, etc. 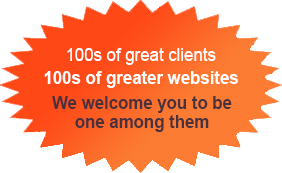 Being your official website designers, We don't charge extra for search engine optimization. We believe without search engine optimization none of the web projects are complete. Therefore, we have included SEO (Search engine optimization) free with every package we offer. We offer Search Engine Optimization for pre designed websites (websites that are not designed by us) as well with moderate charges. Please contact us for more details.